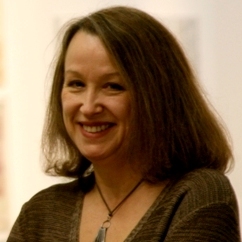 Dr. Loraine Leeson is a visual artist who works through social engagement. This specialism underpins her role as programme leader for MA Art and Social Practice and module leader for the exit degree BA Fine Art Social Practice in the Department of Visual Arts - also her previous appointment as Fulbright Scholar in Residence at University of Washington Tacoma, where she introduced community engagement into its programmes. Loraine is director of the arts charity cSPACE, and chair of the strategy group Arts for Labour plus the film and video production and training centre Four Corners. Her research focuses on the role of art in social and environmental change through bringing community-based knowledge into the public domain. She is particularly known for her work in support of the campaigning communities of London’s Docklands in the 1980’s, and her later use of digital media and the Internet to explore collective creativity. A retrospective exhibition celebrating thirty years of her practice toured Berlin, London, Toronto and Dublin 2005-08. Her art practice with people has been recognised through a Media Trust Inspiring Voices award and Olympic Inspire Mark, while her public artwork The Catch involving 300 children became a London 2012 Landmark and Active Energy received the 2016 RegenSW Arts and Green Energy award. 2017 saw her 1970s photomontage work in support of health campaigns exhibited at ICA London as well as the Routledge publication of her book Art:Process:Change – inside a socially situated practice. PhD supervision/ Director of Studies relating to research in social practice. ‘Experience as Art: Fine Art Social Practice Modules at Middlesex University’ in Principals and Practices of Teaching Social Practice, Allworth Press, New York. (2018). Collaboration with Alberto Duman. ‘Giving More Than You Take: a conversation about the ethics, responsibilities and practicalities of facilitating student participation in community-based projects’ in The Tetley Feast, Leeds College of Art. (2015). My research focuses on the role of art in social and environmental change through bringing community-based knowledge into the public domain. I welcome applications for PhD supervision relating to research in social practice, particularly where this is practice-led. CoI/ Lead Artist in AHRC networking project to bring the arts to bear on urgent issues of water conservation in Rajasthan’s desert regions https://rajasthanwater.weebly.com. A ten-year project with The Geezers seniors group and an extended interdisciplinary team to harness tidal energy from the Thames. www.active-energy-london.org. A more comprehensive account of my reserach and practice can be found at www.cspace.org.uk and in my monograph Art:Process:Change – inside a socially situated practice (Routledge, 2017). Relations of Care in Rajasthan’s Traditional Water Infrastructures, AHRC Networking Award, led by University of West of England, £58,000, 2017-18. COI. Hydrocitizenship, AHRC standard grant led by Bath Spa University, £1.5m. 2014-17. Consultant. Concepts brought to life: Using mobile digital photography to enrich students’ theoretical understanding, Learning and Teaching Research and Scholarship Grant awarded by Middlesex University, £6311, 2015-16. Member of cross-faculty project team. From 2000 – 2016 I raised over £600,000 in funded grants and contracts through The cSPACE Trust or independently from funding bodies including National Lottery, Arts Council of England, Western Riverside Environmental Fund, Royal Docks Trust and Jack Petchey Foundation. Audio Arts, The Visual Arts in Tower Hamlets, ed. W. Furlong, Vol. 5 No.2, Pt.2 1982, cassette tape. Museum in Docklands, ‘New Port, New City post 1945’ gallery, London.